At this sports centre you can do weight training, aerobics, ice skating, yoga, rock climbing or trampolining. There are indoor courts for badminton, table tennis, squash, basketball, volleyball, soccer, cricket or netball. They also teach dance and martial arts. There is a Juice Bar you can visit on Floor 1. If you like what you try and want to use the centre more you can get membership. To do this you need to ring 0207 686 2363 to book an appointment with a membership advisor so you can discuss your needs. The Gym Instructors can help you work out what exercises are good for you to do. Staff here can support you to fill in a form for an Izz Card (Islington card) to get cheaper prices. All you need to do is call an advisor on 0207 686 2363 for information or to book an appointment. Sobell leisure centre is a non-smoking area. If you know what you want to try it's a good idea to call and arrange your visit. If you have an IZZ card it costs £2.50 to swim at any time. If you get a concession it costs 1.20 to swim at any time. If you need a helper they can get in free. If you have an IZZ card it costs £2.50 to climb at any time. If you don't have an IZZ card it costs £3.50 to climb at any time. You can do a climbing course with a group for 5 weeks. Every week you have a 2 hour lesson. Your group can have 12 people in it and 2 trainers will help you learn. If you have an IZZ card it costs £65 to do the course. If you don't have an IZZ card it costs £75 to do the course. If you have an IZZ card it costs £3.50 for 90 minutes. If you don't have an IZZ card it costs £4.30 for 90 minutes. If you have an IZZ card it costs £18.60 for 6 trampolining lessons. If you don't have an IZZ card it costs £24 for 6 trampolining lessons. If you have an IZZ card it costs £2.0 to skate at any time. If you don't have an IZZ card it costs £3.20 to skate at any time. You can buy well priced food here. The menu changes every day. A toasted cheese and tuna melt with salad will cost about £2.60. A coffee and cake costs about £1.10. 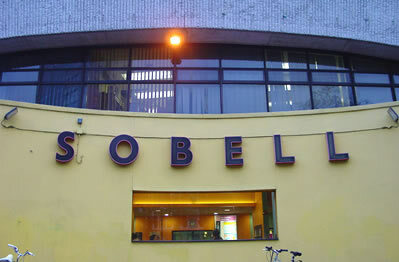 Sobell leisure centre is very near the new Arsenal football ground. There is accessible parking in front of the main entrance in the staff car park. This has a paved surface. There is pay and display parking at the back of the centre. 91 is the nearest fully accessible bus. N91 is the nearest fully accessible night bus. (Picadilly & Victoria lines) - Finsbury Park underground station is about 670 metres from Sobell. Finsbury Park underground station is not accessible for wheelchair users. (Picadilly line) - Holloway Road underground station is about 840 metres from Sobell. Finsbury Park mainline station is about 670 metres from Sobell. Finsbury Park mainline station is not accessible for wheelchair users. The main entrance to the reception building is flat through double doors. There are 2 floors, the Ground floor and Floor 1. The smallest doorway inside are the toilets in the ice skating room. The Women's is 530 mm wide and the Men's is 630mm wide. This is where the reception, gym, indoor courts, ice skating rink, rock climbing walls and trampolines are. There is a large accessible toilet and changing rooms. There is a lift to reach Floor 1. The doorway is about 860 mm wide. You can buy drinks and snacks from the vending machines - a bottle of drink costs about £1.00. The entrance to the changing rooms is about 795 mm wide. There are Men's and Women's changing room. They both have a group changing room inside. The doorway for the group changing room is 715 mm wide. The changing rooms have toilets and showers. One of the showers has a fold-down seat. There are also non-slip rubber mats. The doorway to the shower in Men's changing room is 765 mm wide. The changing rooms have 1 small accessible toilet each. They also have an accessible hand basin, about 640 mm high. This is where the dance studio, cafe, junior gym and out door court viewing gallery is. The Accessible toilet is in a unisex area on the Ground Floor, it's excellent! It has an accessible changing facility and shower. There is good colour contrast and hand-rails. The doorway is about 890mm.